The term pharaoh was the title of an ancient Egyptian king who was considered to be a living god and worshipped as a deity. Nitocris is believed to be the first female Pharaoh of Egypt. 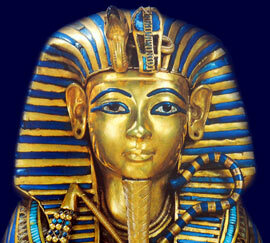 The pharaoh was an absolute ruler of Egypt, both the political and religious leader. Biography and accomplishments or why Nitocris was famous: Nitorcris was a queen of Egypt mentioned by the Greek Herodotus and Manetho. Manetho was the greatest Ancient Egyptian historian who lived during the 3rd century BC. Manetho recorded his Aegyptiaca (History of Egypt) in which he includes a chronology of the reigns of Ancient Egyptian pharaohs, taken from ancient 'King-lists' which were held by the pharaohs. Manetho described Nitocris as 'the noblest and loveliest of the women of her time'. She is mentioned by the Greek Herodotus: From The History of the Persian Wars, c. 430 BC as the Queen who commissioned works changing part of the course of the River Euphrates, created lakes and built roads into Media in Babylon. She was married to Pharaoh Nemtyemsaf Merenre who reigned from 2283BC - 2278 BC and famous as the first female who was given the title of Pharaoh. She is believed to have committed suicide on the death of her husband. Each section of this Ancient Egyptian website addresses all topics and provides interesting facts and information about the Golden Age of Pharaohs and of Nitocris. The Sitemap provides full details of all of the information and facts provided about the fascinating subject of the Ancient Egyptian Kings - their life, family, reign, dynasty, important dates and events and accomplishments.